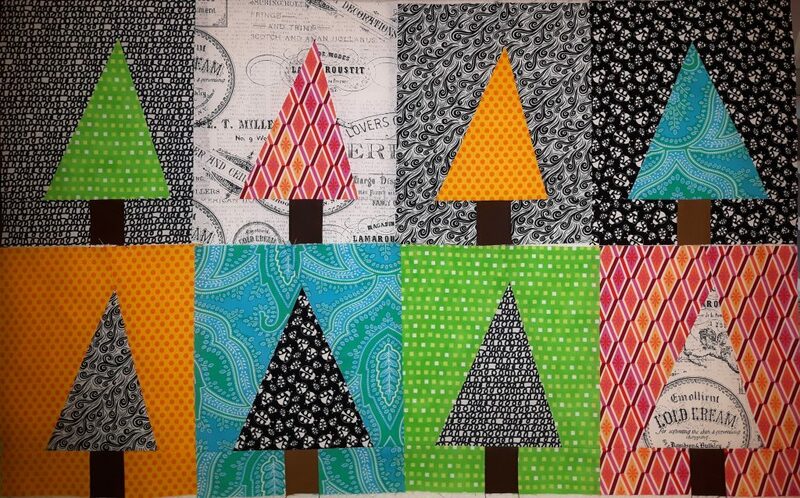 This month we’re going for fun and festive modern improv tree blocks! We’re going to use the tutorial from Amy Smart at Diary of a Quilter but to mix it up a little, we’re going to change the colour scheme. Instead of a typical red and green palette, we’re going for B&W prints paired with bright colourful prints. We’re hoping to end up with blocks for a cheerful funky quilt suitable for anyone, regardless of what/any holidays they celebrate in December. This tutorial makes two blocks at a time, so it has minimal waste, and they go together pretty quickly. You might find it easier to cut your two main fabrics into 8.5″ x 10.5″ rectangles and then sub-cut them into the square and the strip. The tutorial doesn’t mention it, but I found it easier, and if you are using a directional print, you’ll be able to make sure that the square and the strip are facing the same direction by cutting them together. I (amy) made up some samples. I don’t have much colourful fabric in my stash that isn’t tone on tone, but I tried! You can use whatever (modern) colourful print you like, as long as it contrasts with your B&W print. Try to avoid prints that are specifically “Christmas” themed, save those for a quilt for yourself!